Welcome to the natural beauty that is the BC wilderness. 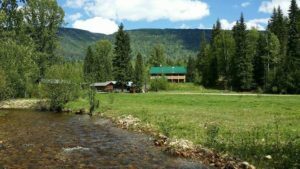 Stay and enjoy the peace and quiet at our 160 acre ranch surrounded by the pristine wilderness of Wells Gray Park. You will find countless opportunities for wildlife viewing. Local animals include moose, bears, wolves, coyote, and beavers to name a few. Take a walk along one of the trails by our creek to see some of the beaver dams or join a nature walk and learn about the local flora and fauna. In the spring and early summer the Hummingbirds are abundant and very busy, so wonderful to watch. We have a private lake where you can take your morning coffee. Sit, relax and enjoy the sunrise with only the sounds of the birds to start your day. We offer heritage log cabins as well as B&B accommodations. A breakfast room and lounge area are available for relaxing and socializing after a busy day in the park with games, cards, wifi and satellite tv. Spend a peaceful evening watching the flames dance at our outdoor fire pit by the creek, maybe even toast a marshmallow. 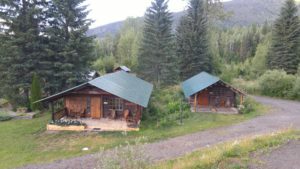 Wolfwood is a family run guest ranch and wilderness school. Born and raised in BC, we have explored this province extensively and are so pleased to have found the perfect home in Wells Gray Park for raising our family. All of us have a background in tourism and love meeting people from all over the world. 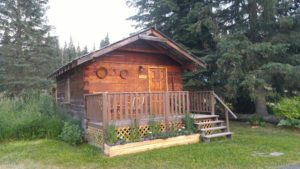 Wolfwood Guest Ranch gives us the opportunity to get away from it all share our pioneer lifestyle with our guests while enjoying the unspoiled beauty of Wells Gray Park. Tarn & Joanne White, their 2 children, Taya and Dax and Tarn’s mother Deane Williams all look forward to meeting you and sharing their knowledge of the wilderness and Wells Gray Park. Through our onsite wilderness school we also offer classes in survival, pioneer and homesteading skills and wilderness experiences. Included with your stay is a wild edibles nature walk, we hope you can join us. Have a look at our website for other courses available.